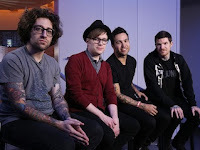 Fall Out Boy have revealed they wrote songs for One Direction that never ended up being used because they were "too odd." "Last time we were in London we wrote with the guys in One Direction," Wentz said in a recent interview with The Daily Star. "It was a great session but I don't know if Fall Out Boy writes what One Direction wants to sing. There's a certain area of odd that we can stake a place in, but it's like we have the language of twins. Maybe it's too odd for One Direction because they didn't end up using the songs this time."